Fire Detecting Wallpaper: The wallpaper of the future! Have you ever heard of wallpaper that can not only detect fire in the area that it is in but also helps in preventing its spread? Well neither have I until now that is. Researchers have come up with wallpaper that can detect fire and which is also fire resistant. Made of a material that is found in bone teeth and hormones, yes you read right, this fire detecting wallpaper, may actually stop the spread of flames and also alert you to the fact that your house is on fire. Those colorful, beautiful wallpaper that you find in stores today are actually highly flammable made of such materials such as plant cellulose fibers and synthetic polymers, these wallpapers will help a fire spread in the nick of time making recovery of anything near impossible. Researchers of the fire detecting wallpaper have swapped out those flammable materials for something strange yet environmentally friendly. Fire detecting wallpaper is made of a material commonly found in bone teeth and hormone, (God knows where they got the idea from), this material known as hydroxyapatite is fashioned into long and by that I mean really long nanowires to give it high flexibility. This hydroxyapatite material, that is used to make the fire detecting wallpaper, actually helps the wallpaper in preventing the spread of flames. Researchers didn’t just make the fire detecting wallpaper preventive of fire, they also wanted to make it “smart”. To do this they added sensors to the fire detecting wallpaper made from drops of graphene oxide in an inky mixture. 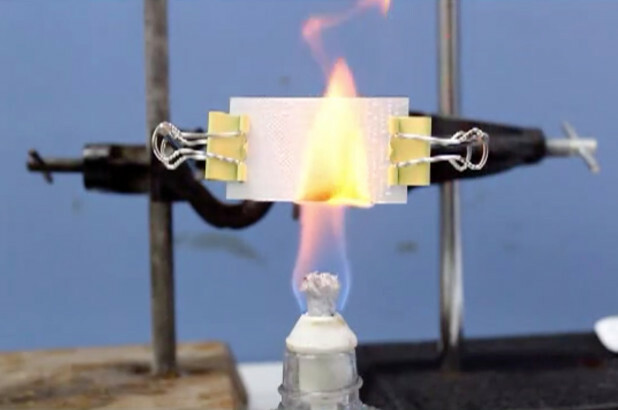 This graphene oxide acts in two ways, at room temp, it acts as an insulator, that is it blocks the flow of electricity while under high temperature say when there is a fire, it makes the fire detecting wallpaper conductive and this completes a circuit that sound an alarm. Researchers also boast that this alarm on the fire detecting wallpaper can last for a prolonged period of more than five minutes. So to fit it all in one nice package, the fire detecting wallpaper is not only non-flammable but also high in temperature resistance and has an automatic fire alarm. The wallpaper that you find in today’s stores are highly flammable and won’t do nothing when it comes to a fire in the house while the fire detecting wallpaper has a high flexibility, it can also be processed into various shapes, made in different colors and made with a commercial printer. But all this won’t come cheap, the fire detecting wallpaper, because of their materials come at a very steep price tag. They may be environmentally friendly but not really pocket friendly, making you think that you’d rather take your chances when and if there is a fire with normal wallpaper. The next thing on the agenda, therefore, for scientists is that they now are looking for more cost effective ways of making fire detecting wallpaper, that will be easy on a person’s wallet.